A single portion of takeaway curry can contain over 1,000 calories and a huge amount of saturated fat, salt and sugar. You’d need to cycle for about three hours to burn it off. The best way to enjoy your favourite dishes is to ditch the takeaway and make your own. A takeaway of onion bhajis, tikka masala, pilau rice and poppadoms is likely to have 2,287 calories. Do you know which curry ingredients contain the most calories? Take the test below and find out if your knowledge is hot like vindaloo or mild like korma. Replace or supplement meat with tofu, beans or pulses and vegetables such as spinach or kale. Cut back on oil – you can simmer onions in stock instead of frying. Replace cream with low-fat yoghurt or light coconut milk. Use a little plain flour to thicken sauces instead of adding ground nuts. Always remove visible fat and skin from meat before cooking. Dhansak is a great curry if you're cutting back on calories. The meat is supplemented with lentils. To slash the calories further, cut back the oil, omit the sugar and replace some of the meat with spinach or kale. Search for Lamb dhansak in the recipe search bar for the recipe shown in the picture. For Chicken tikka masala, simmer the onions in stock instead of frying them – you can even blitz them afterwards to thicken the sauce. Replace the cream with yoghurt or fat-free fromage frais. Search for Low-fat chicken tikka masala in the recipe search bar. Korma is usually a no-no if you're watching your weight, but you can cut it down to less than 300 calories per person if you skin the chicken, use low-fat yoghurt and omit ground nuts (using a little plain flour instead to thicken the sauce). Search for Hairy Bikers chicken korma in the recipe search bar. 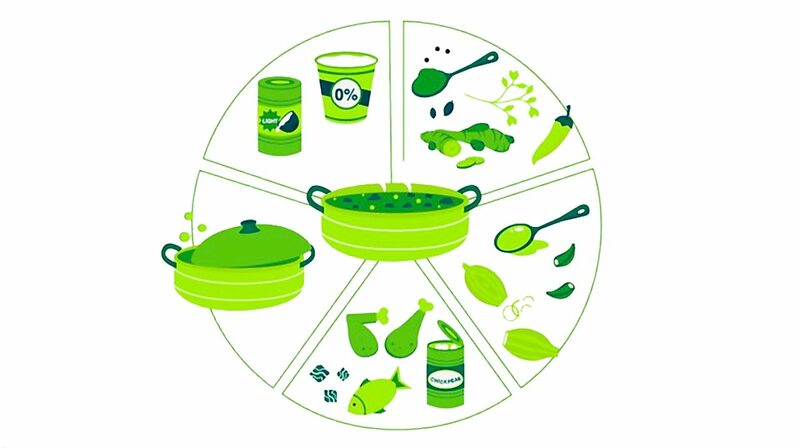 You can enjoy a Thai green curry with rice for less than 360 calories if you use tofu rather than chicken, choose light coconut milk and slash the amount of oil. Search for Green vegetable curry in the recipe search bar. For a Chicken balti with less than 350 calories, use low-fat yoghurt instead of cream, bulk out sauces with extra tomatoes, and always use skinned chicken. Search for Chicken and vegetable balti in the recipe search bar. Short of time? Get your protein quick with our chicken, salmon, tofu, egg and bean dishes. 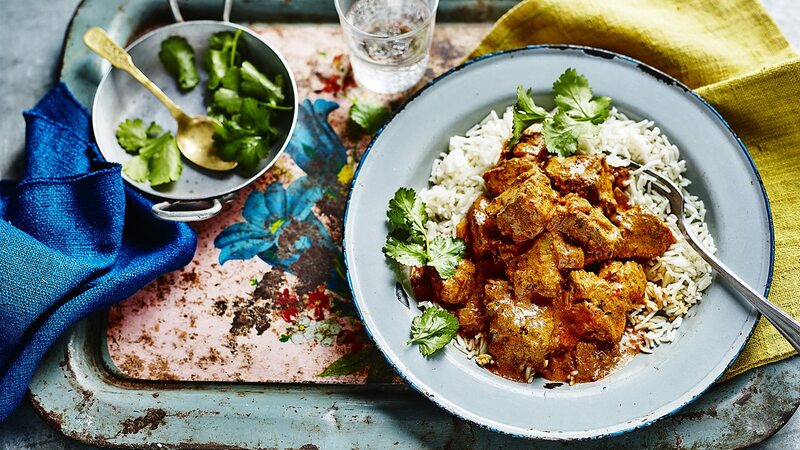 Enjoy a lighter curry with these simple, tasty recipes. This tasty, value dish is great for cutting calories in curry and making ahead of time. Making your own curry paste is the healthier way to go. Packed with flavourful ingredients, lighter coconut milk makes this a healthier twist on a Thai favourite. 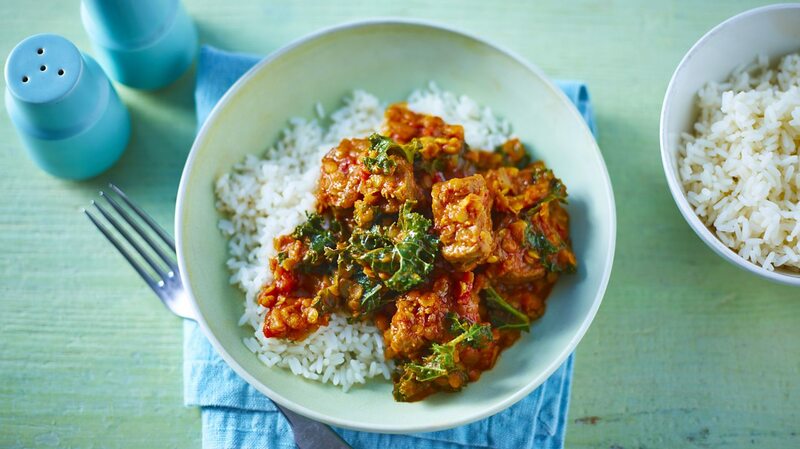 Making your own tikka masala sauce isn’t so tricky, so enjoy a lower calorie version of this favourite dish.